Siata 208 Corsa Spider. The unique V8 sports car built by Nuccio Bertone himself to go racing. In 1952, coachbuilder Nuccio Bertone created a unique V8-powered sports car just so he could go racing. Now Octane drives it. Words John Simister. Photography Dirk de Jager. Two key facts make this car irresistibly interesting. 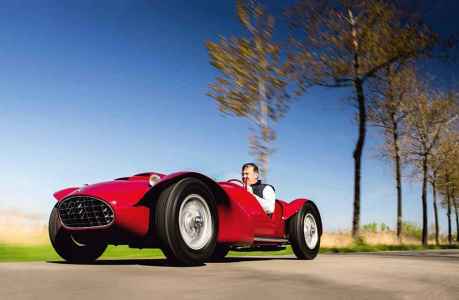 It’s a one-off, built in 1952 by Nuccio Bertone himself so he could go racing. And it’s powered by what is, unless I’ve missed another, the first post-war, clean-sheet, Western European V8 engine. This engine is not as other roadgoing V8s. Its capacity is just 1996cc, and its two aluminium banks of cylinders are a highly unusual 70° apart. And it was conceived, in war-ravaged Italy, in direct opposition to the mood of the time and place. Alfa Romeo, for example, was reinventing itself as a maker of mass-produced saloons rather than a creator of expensive sporting machinery. So what was Fiat, the company behind the diminutive V8, thinking? Whatever Fiat’s thoughts were, the V8 was excellent news for Italy’s specialist car-makers. Siata - the name an acronym for Societa Italiana Auto Trasformazioni Accessori - began in 1926 to make, as you have guessed, car accessories. Post-war it became Societa Italiana Applicazioni Tecniche Auto-Aviatorie and a maker of complete cars, beginning with small sports cars based on Fiat mechanicals, that changed in 1952 with the arrival of Fiat’s V8 motor, or 8V as Fiat called it to ward off any trouble from Ford. Siata devised a chassis to accommodate the 8V, and indeed other, larger V8s should buyers require them. As it turned out, only one such large-V8-engined machine was built, with a Chrysler Firepower motor. Fiat itself had intended the 8V to power a new luxury saloon, but sense and the lack of a ready market prevailed. So it devised its own grand tourer, and built just 34 of them with factory bodies up to 1954. Another 30 were bodied by Zagato, 50 more by other coachbuilders - most notably Ghia, which created eight rather fabulous Supersonics. That’s 114 Fiat 8Vs in various costumes. 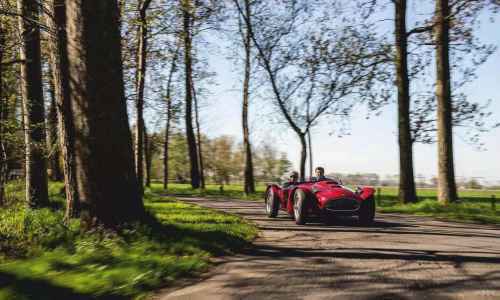 Another 60 engines found their way to Siata to be fitted to the new chassis for a car called the Siata 208S. This chassis, designed by Rudolf Hruska (mid-engined Cisitalia Grand Prix car with Ferdinand Porsche; much Fiat and Alfa Romeo work including the Alfasud project), brought its hefty oval-section longitudinals closer together in the mid-section, allowing the seats to be set low next to them instead of sitting on top. The suspension, independent front and rear, used the Fiat 8V’s enclosed coil-spring and lever-arm damper units, the damper’s arm formed the suspension’s upper link, with a wishbone below. 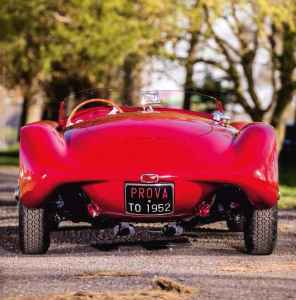 Most Siata 208s were clothed in a spider body by Motto, some in a coupe body by Stabilimenti Farina (an organisation separate from the more famous Farina company, which became Pininfarina). And there was the unique car we have here, the personal project of Nuccio Bertone, then aged 37, created by him in his own carrozzeria on chassis number CS 054. 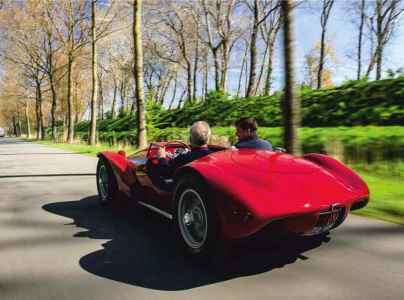 It is called Siata 208 CS: 2.0-litre, eight-cylinder Corsa Spider. Its design shows a metamorphosis from separate-mudguard sports cars, or even open-wheeled racing cars, to a one-piece body in an unusual, almost playfully artistic and pointlessly impractical way. Why else would you go to such lengths to blend those mudguards into the body, to make them seem simultaneously separate and all-of-a-piece, other than because you can? Then there are the stacked bonnet louvres, the tiny headlights in pods. And some token aerodynamics: outlets for hot engine-bay air at the rear edge of the front wings, just ahead of the cockpit, and the flowing of the rear wings into the rounded tail. Separateness becomes integration, 30 years of styling evolution in one panel. Gaze at that tail for a while, at the air channels between the wheels and the central part of the body, and you can see where the BAT concept cars came from. The whole car oozes race-me keenness, set off by the aluminium-rimmed Borrani wire wheels with big air-scooped, finned drum brakes behind them and authentic-looking Pirelli Cinturatos surrounding them, The Spider ran on the same tyre type back in the day, as shown in photographs with Bertone at the wheel, but this type was called Cintura (Italian for ‘belt’, a reference to its radial-ply construction) back then. So Bertone had his V8-powered racing car. How did he get on? It seems that he entered his machine in the 1952 Mille Miglia but didn’t make it to the start, perhaps because the car wasn’t finished in time. He certainly tackled that year’s Coppa d’Oro delle Dolomiti, but failed to finish within the time limit, and an outing at the Aosta hillclimb was sidelined by carburettor trouble. Meanwhile, Bertone’s family was pressuring him to give up this racing lark and concentrate on the business, and by the end of the year he did just that. The Corsa Spider then found itself at the New York International Motor Sport Show early in 1953, having already been featured in Siata’s brochure. Presumably the idea had been to make a few more examples, but that never happened and one John Perona bought the Spider after the show. In the 1960s it passed to John Holman of the Holman & Moody tuning company, famous for its fast Fords (including several of the 1966 Le Mans GT40 Mkll entries) and sometimes referred to as Holman Moody, The next owner was Jarl de Boer, a US-based Siata expert who kept the Spider for 30 years in his backyard. That the body had been slightly squashed while the Siata was stored on a pallet added to that challenge. Dutch restoration company and 8V specialist Strada e Corsa co-ordinated the resurrection, working on the mechanical parts in-house and subcontracting the bodywork to Quality Cars in Vigonza, Italy, a company whose craftsmen include a genius of panel gaps, The engine rebuild proved expensive, because the process had to be gone through twice. That’s not because there was anything wrong with it the first time, though, The engine fitted to the Spider as bought by Jan was not its original, but Fiat 8V motors are rare enough for Jan to have considered it worth rebuilding - only then he managed to locate and buy the one it was built with, number SC 005. Its owner, knowing he was in a strong position, required not only Jan’s newly rebuilt engine in exchange but also money, after which Jan had to pay for another rebuild, this time for his original- numbers motor. He winced at this, as you would, but in the end he had to do it, as you do. And now here is the Siata, complete, staggeringly good-looking and waiting for me to sample its charms, The body’s sparse sleekness I’ve already alluded to, but I’d like to add my appreciation of the forward-leaning radiator grille with its convex, Ferrari-esque slatwork, the ‘Siata Torino’ nose badge with a side view of a Siata coupe traversing a large letter ‘S’, the exposed side exhaust pipes ducking under the floor to re-emerge at the tail, the circular bootlid complementing the shape of the spare wheel beneath. Appreciation of the 8V engine, too, once the bonnet is lifted off. We’ll stick with the 8V designation even though it has, of course, 16 valves. Such numbers meant different things in 1952. Two twin-choke Weber 36 DC3 downdraughts, filter-less but with mesh over their trumpets, sit proudly between the rocker covers, while curiously upward-facing exhaust ports feed into a pair of up-and-over, four-branch manifolds. A glass-topped mechanical petrol pump terminates a long, finned extension casting on the engine’s front left corner, an unusual solution to the problem of fuel vaporisation. Now I have climbed over the low cut-out in the doorless flank and inserted myself in the red leather bucket seat with its trio of vertical cooling vents behind my back, The height of the tunnel and gearlever to my right emphasises how low I’m sitting, down next to those inner chassis tubes. I’m more comfortable than passenger Jan, though, whose legs are hooked over a smartly trimmed box in black leather located just in front of his seat. Inside it is the battery. He does, however, have a higher body side to lean against, and unlike me he has entered the cockpit via a small door. 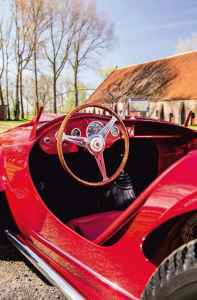 Behind the large steering wheel with its wooden rim and polished spokes is the starkest of dashboards, painted in body colour, lacking a speedometer and reduced to no more than a slender tube on its right-hand side, The four Jaeger dials’ rims, formed of ribbed aluminium, are little pieces of art in their own right, The needles within report revs, oil pressure and the temperature of the engine’s two vital liquids: all that a racing driver needs to know. A further ‘S’ adorns each of the floor-hinged pedals. Having turned a large ignition key and fired-up the engine, I press the left-foot one and select the lowest of - surprisingly - five forward gears. A slight snick betrays a lack of first-gear synchromesh, to be expected in a gearbox from 1952. Next time I’ll be sure to slow the gear clusters by touching second gear before selecting first at a standstill. Off we squirt, engine emitting a crisp, enthusiastic, richly complex blare. It’s not an obvious V8 beat; neither is it the pure howl of a flat-crank motor. It’s somewhere in-between, its pitch that of a fruity four-pot, its unsilenced inhalations deeply snorty, its exhalations slightly blattery. More than anything the soundtrack resembles that of a pre-war Alfa Romeo straight-eight, another engine whose cylinder-count isn’t immediately obvious from the soundwaves it generates. A few precise and easy gearshifts later, we’re cantering along the road with senses enjoyably battered, The low windscreen, its double-curved upper edge following the scuttle in being higher on the driver’s side, deflects the main onslaught but backdraughts are rampant, changing the volume of the engine’s heady blare in staccato bursts. 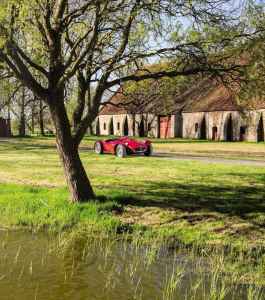 That blare gets particularly thrilling as the revs rise, thanks to 160-170bhp rather than the 110bhp of Fiat’s factory specification, due in part to Siata’s freer-breathing camshaft. I touch 6000rpm long enough to sense what Nuccio might have sensed during the Spider’s too-few racing exploits, but unlike him I have the reassurance of new Carillo connecting-rods to ensure the engine stays together. The steering, by worm-and-roller, proves quick to respond as we aim through a couple of gentle bends, and quite accurate with little in the way of a dead patch straight ahead, this is an agile machine, supple too thanks to a rigid structure and that soft independent suspension. Given some protection against the elements and a repositioned battery, this could be a very entertaining tourer. You could even think of it as a kind of primordial super-Caterham. At the 2017 Pebble Beach Concours, this Siata won its class, the following year it was back on the Californian peninsula to be offered at one of the Pebble Beach auctions, but it didn’t sell despite looking as perfect as you could ever imagine a car to look. Siatas are very rare cars and much prized, and no Siata is rarer than this 208 CS because there is only the one. 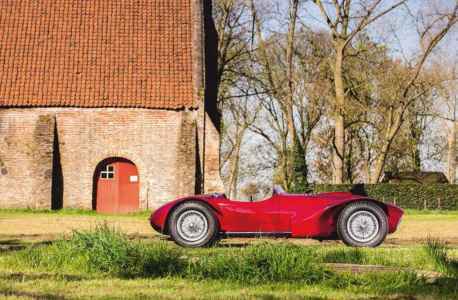 Would it be more valuable and desirable if it were one of several, as might have been Siata’s and Bertone’s plan, with the limited-production credibility that would bring? Or less valuable, because its Bertone-owned, Bertone-penned singularity is its USP? We’ll never know. I’m thrilled simply to have driven it. Above. Cut-out in the bodywork on the driver’s side is deeper than that on the passenger’s, trading cosiness for more space to work at the wheel. Above and below left. Detailing includes pretty dials and badging; dainty-looking 2.0-litre V8 is the original factory engine; raced in the US during the ’60s by former owner John Holman.